As the Founder of Potomac Financial Group, Larry Grabenstein spent nearly four decades helping clients prosper and reach their goals while maintaining a sense of confidence and balance in their daily lives. A tremendous resource and educator, Larry helped individuals, families and business owners plan for sound futures through personal service and objective guidance. Born in Cumberland, MD, Larry graduated from LaSalle University in Philadelphia where he earned his undergraduate degree in 1968. Larry went on to earn his Master of Arts degree from the University of Maryland before teaching political science at Our Lady of Good Counsel High School in Silver Spring, Maryland. After five years of teaching, Larry switched careers and entered the financial services industry in 1973 as a financial advisor. 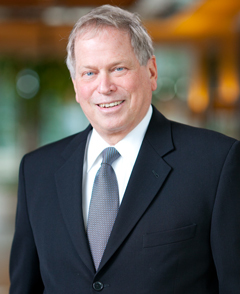 In 1983, Larry joined Raymond James and established the Potomac Financial Group. Larry spent 34 years affiliated with Raymond James Financial Services and leaves behind a legacy of managing one of the top practices within the Raymond James organization. Just as he once taught students the skills they would need to be successful in college and in life, Larry not only mentored clients on the dynamic and challenging subject of financial planning, but he also mentored many financial advisors who would go on to build successful financial planning practices themselves. Sadly, in the summer of 2016, Larry was diagnosed with brain cancer which forced him to completely retire from the business and work that he loved so much. He passed away on June 16, 2017, after battling the disease for nearly a year. Larry leaves behind his wife, Cheryl, four children, Allison, Michael, Kara and Jenna, as well as ten grandchildren and many more family and friends. Family, friends, and clients alike, knew Larry as someone who upheld the values of trust, integrity and honor. His legacy here at Potomac Financial Group will live on forever.